Sometimes we forget or don’t even know the people who create the beautiful spaces that enrich and enliven our city. Many of us drive along Queens Road West in Myers Park, for example, and assume that the majesty of the that tree-lined boulevard just happened. Others marvel at the splendor of Colville Road (pronounced “Callville”) in Eastover and believe that it just happened.. The grandeur of such places was meticulously planned by a single human being. His name was Earle Sumner Draper. In October, 1915, young landscape architect Earle Sumner Draper stepped off the train at the Southern Railroad Station on West Trade St. A recent graduate of the Massachusetts Agricultural College, Draper had been hired by John Nolen, the designer of Myers Park, to come to Charlotte to design lots for new homeowners in Charlotte’s most fashionable streetcar suburb. Draper prospered in Charlotte. In 1917 he established his own landscape architectural firm. For the next 16 years, Draper and his associates participated in the boom times that swept the South, especially during the 1920’s. In addition to Eastover and parts of Myers Park and Elizabeth, Draper designed portions of the campuses at Davidson and Winthrop, entire mill towns, such as Spindale, N.C., the Homestead Mill village in western Mecklenburg County, and the new town of Kingsport, Tenn.
Draper and his wife, Norma, and their three children moved into their new Tudor Revival style home on Queens Rd. in 1923. The architect was Franklin Gordon, a Maine native who had come to Charlotte in 1905. The builder was the Clement Construction Company. That firm would also build Duke University’s gothic stone buildings. 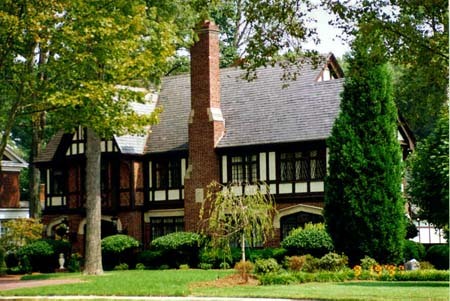 Until the Great Depression, when Draper closed his business and became the Director of Town Planning and Housing for the TVA, he and his family enjoyed a sumptuous lifestyle in their home in Myers Park. The children rode to school in a chauffeur-driven car. A gardener tended the grounds. A cook prepared the meals, and a maid kept the house tidy. Draper sold the house in 1944 and established his permanent residence in Washington, D.C. He retired to Florida in 1965.